Mobile app retention continues to plague mobile marketing teams, with the large majority of users abandoning applications within the first month of download. If you have any chance of standing out in a marketplace of millions of apps, your product must solve a big enough problem or offer enough value to warrant your customer’s continued use. This continued use builds trust and loyalty between the company and consumer that can extend offline. It might surprise you to learn that 53% of smartphone users don’t even have their favorite brand’s mobile app installed.1 With limited data storage space, attention span constraints, and previous experiences with poorly built mobile apps, there could be a whole host of reasons why this is the case. This is why having a strategy for mobile engagement and retention — not just an acquisition strategy — is vital. If a competitor can offer an exceptional mobile user experience that offers more value, this company might supplant brand favoritism and loyalty in the mind of your hard-won customer. 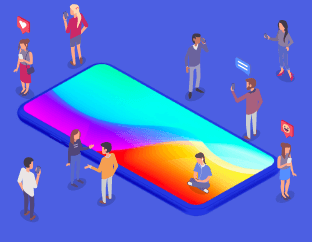 There is a lifecycle of app retention that requires establishing a genuine connection on the first impression, growing a sense of dedication to their needs, and continuing to nurture the relationship. Like personal relationships, you should aim to have a friendly yet productive appeal to your users. Below we have compiled app retention statistics across the industry and devices. Browse through them or jump to our infographic about how app retention is like dating and getting engaged.